Utah's five national parks are a wonderland for landscape photographers. A person could spend a lifetime bouncing around from park to park and season to season and still find unusual and fascinating subjects to capture. The fascinating and unusual geologic history of this state has created formations that simultaneously boggle the mind and fire the imagination. Dramatic weather systems move through with authority and completely transform a scene. Sunrises and sunsets throw soft light on fluid rock formations beneath enormous pastel backdrops, blurring the line between landscape and portrait photography. The sheer size of each of these parks can feel overwhelming, and planning a trip through several is a big task. Zion, Bryce Canyon, Capitol Reef, Arches, and Canyonlands national parks are each worth a week, at least. Recognizing that most of us don't have that kind of time, we've put together a sample itinerary with a two-week window that may help you shape your own agenda. Ideally you arrange to fly into Las Vegas, which is closer to Zion National Park, and fly out of Salt Lake City, which is 3.5 hours from Arches National Park. Canyonlands from Dead Horse Point State Park. Photo by Denis LeBlanc. Days 1-3: Explore the highlights of Zion such as Angels Landing, Emerald Pools, The Narrows, and the Lower Subway. Days 4-5: Depending on your pace and stamina, you may be able to fit in hikes like North Guardian Angel climb in the north portion of Zion before you head to Bryce Canyon. You'll want to check out the Navajo + Queens Garden Loop and hike the Bryce Canyon Rim Trail be sure to be at Bryce Point for the sunset. Days 6-8: Drive the two hours to Capitol Reef and lose yourself for a few days in this phenomenal place. You'll want to catch Navajo Knobs, Chimney Rock, and Cohab Canyon, but be sure to make room for a trip into Cathedral Valley. Days 9-12: It's another two hours to the Moab area where you can enjoy Capitol Reef National Park and Arches National Park. 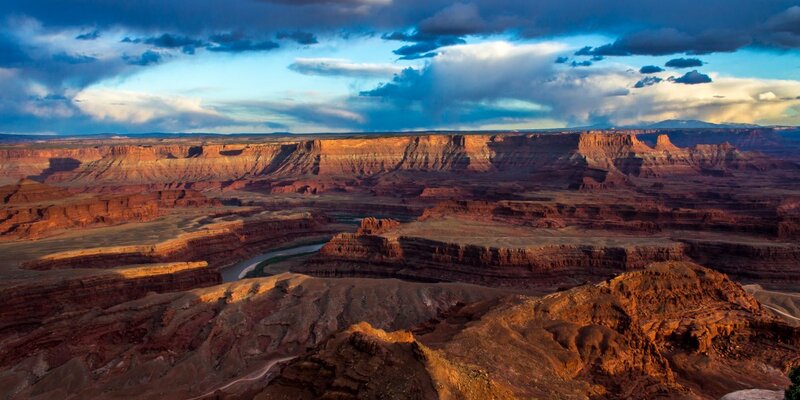 Stay at Dead Horse Point State Park, which has a gorgeous campground just outside of Canyonlands. The Rim Trail provides excellent views into the park. When you are ready to enter Canyonlands, be sure to put a hike to False Kiva on your list of hikes here. Likewise, once you get to Arches National Park, you'll want to get on one of the tours to the Fiery Furnace. Each trip will be a highlight. Once there, Broken Arch and Delicate Arch are both popular and worth a tour, especially if you can beat the crowds. It can be all too easy to speed through a scene, or a timeframe, to move to the next when confronted with an abundance of superb photographic opportunities. Instead, take the time to enjoy these places, and let that experience inform your images. It is difficult to convey a sense of appreciation and wonder in an image if you aren't feeling it yourself! Settle down a little and take in the moment, and the images you capture are more likely to incorporate the majesty you appreciated at the scene. Don't limit yourself to national parks. As if your itinerary wasn't already crowded, consider the fact that equally stunning geologic wonderlands exist outside of Utah's five national parks. Kodachrome Basin State Park and Grand Staircase-Escalante National Monument are each examples of side trips that are well worth making room for in your itinerary, and there are plenty more. If you can spend the time, you won't regret it. Magic hour shooting is no secret, but in certain situations it can be a more important component of your success. Given the high temperatures, high-contrast mid-day light, and occasionally big crowds, shooting early and late in the day in Utah's national parks dramatically increases your chances of finding the right moment. Not only will you spend less time cloning bystanders out of your final images, you'll stay cooler and enjoy a broader range of color and tone on the landscapes. Of course, if you have to shoot mid-day, embrace it! Filters can go a long way toward mitigating high-contrast light, or you can migrate over to a black and white mindset and explore themes like texture, shape, and shadow in the landscape.